Puff Sleeve Sweaters, Pearls, and Pumps…oh my! Even though the past week was crazy at work with our mens shop opening and the big boss in town, I’m so grateful for everything I have. I’m blessed to do what I love and that’s everything to me. In the midst of my work week, I also set in motion some exciting changes to the CCB Diaries family that will be coming in the fall. I can’t wait to share it with you all in the months to come! I’ve said from the very beginning that I wanted CCB Diaries to be more than a blog; I’m trying to build a brand over here. I could go on and on about my vision but y’all got places to be so I’ll save that for another post. Let’s get to the outfit deets. San Francisco is sweater weather year-round. And as a sweater lover, that makes me happy. However, our weather has been moody AF lately with 70 degree sunny days and 55 degree rainy days a couple of days later. But that’s okay. I can always count on my strong sweater game to keep me toasty no matter what. This sweater was a last minute addition to my closet in early February when I was experimenting with different thicknesses of sweaters to wear with my coats. Even though this sweater is not coat-friendly, I couldn’t not buy it. I mean, it has puffy sleeves. Nuff said. These pearl-embellished jeans were a spontaneous purchase from Storets about a year ago. I bought them, then thought “why did I buy these”, but kept them anyway. I thought about cutting them into cute shorts at one point too last year but never got around to it. Now here we are, my second time wearing them. They’re so cute! 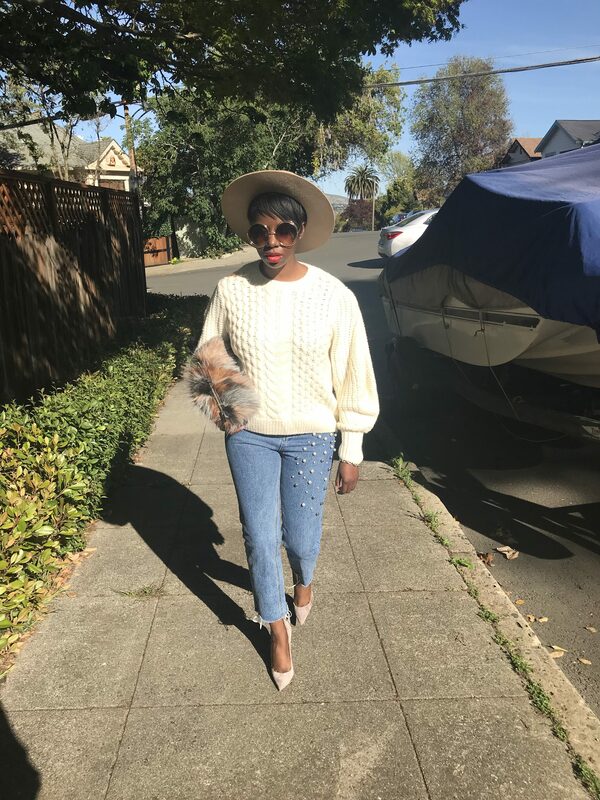 I love the touch of glam that the pearls bring to these jeans and I thought they’d be the perfect compliment to my super feminine sweater. Pearl embellishments are making a strong comeback right now too on everything from denim jackets to joggers. Get you some! And making their blog debut are my newest Louboutin additions, the So Kate in “Storm”. If you remember my Instagram live from a few weeks ago, I talked about how I ended up with these beauties. But just in case you missed it, here’s a recap. I was browsing the Louboutin website one day and came across them. They looked grey in the photos but kinda taupe-ish as well. Now, I’ve been searching for grey suede pumps for years. Louboutin made some in fall 2016 but the way my bank account was set up at the time, I decided to be an adult and hold off. Of course I missed out on them. Sigh. Then these happened. I had to get them. After calling my local boutique to do a stock check (they weren’t getting them), I ordered them online. The color was even more beautiful in person. They’re taupe and I can wear them with just about anything. I feel like I made an even better choice getting these instead. When I first shot this outfit, all I could think about was “this could go really right or be a hot mess”. Because most of the time, my outfits aren’t super extra. It’s not really my style. But with this outfit, I couldn’t help it. I decided to wear my Lack of Color hat, Chloé-inspired sunnies, a matte red lip, and faux fur clutch to complete my look. This hat is amazing and I wear it just as much as my black Reformation hat. If you’re in the market for a well-made but not super pricey hat, I’d look to them first. Y’all have seen these sunglasses before so we don’t need to discuss them. Moving on. My matte red lip is my new fave red. I live for a matte lip but surprisingly I didn’t have an every day red that was matte. Now, I love me some “Stunna” by Riri but it’s too bright for every day. At least for me it is. Cue my style crush Kahlana Barfield-Brown. She showed a matte liquid lipstick called “Feels So Grand” by MAC on her insta stories while getting her makeup done. Shoutout to folks who show the name of the color when they take photos like that. Appreciate y’all. I made a beeline for MAC and bought it as soon as I applied it. I’m in love with this lipstick. This faux fur clutch from She The Collection was a fab find on Instagram. 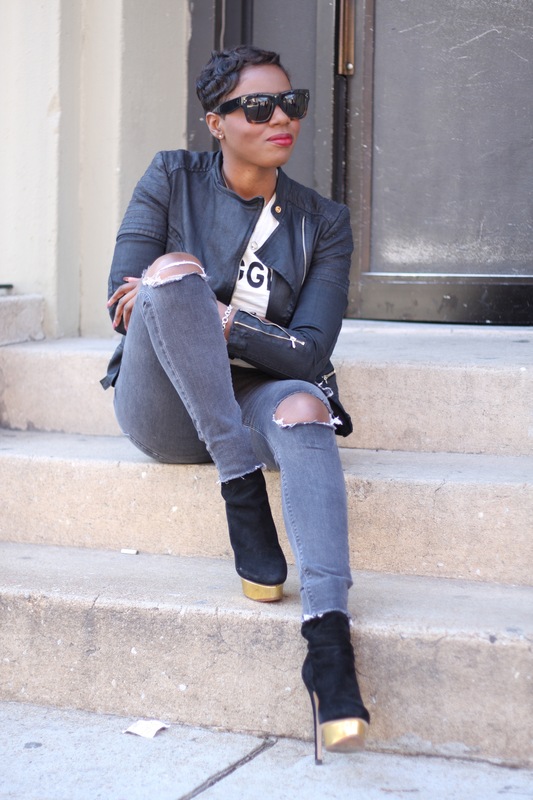 Tahira Joy of “The Cut Life” was carrying a fab clutch on her IG one day and tagged the brand. I went to the site and ordered my own. The rest is history. The other best part? It’s a black female-owned business. Yaaaas! Black girl magic is real. You better get on it!